“Burning the midnight oil” is a phrase that's probably familiar to everyone reading this blog. It speaks to the desire to draw, photograph, paint, and create in any free moment available. Our newest exhibition, Nights & Weekends, celebrates big ideas that come from of a place of passion that keeps you up much later than is probably healthy! Nights & Weekends consists of larger-scale projects by 12 artists, and offers a glimpse into their process. The work on display ranged from comics and watercolor painting, to photography and animation. 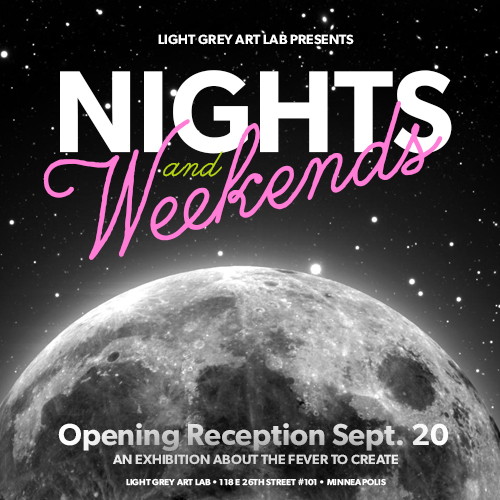 The opening reception for Nights & Weekends is Friday September 20th, from 7-10 PM! It will be a super fun event, as we'll be joined by the Sketchbook Project for the 1703 Miles and Back Tour! For one night only, the Sketchbook Project's traveling library will be parked outside Light Grey Art Lab, and everyone is welcome to pour over the hundreds upon thousands of artist's sketchbooks! We'll also be projecting drawings collected from the Light Grey chapter of the Sketchbook Project on the walls of the gallery the whole night! See a full list of participating artists here! Remember, the opening reception is Friday, September 20th from 7-10 PM! We're located on the corner of Stevens Ave and 26th Street. Street parking is available on Stevens, 26th and 1st Ave.